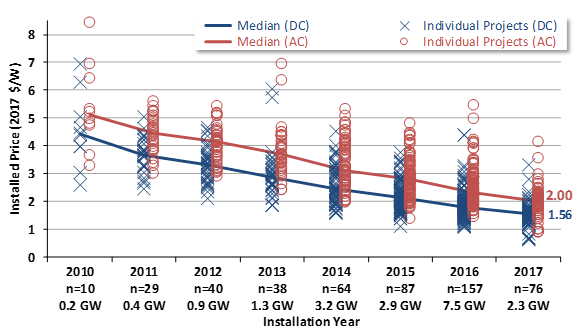 Berkeley Lab presents its 2018 Utility-Scale Solar report, which presents analysis of empirical project-level data from the U.S. fleet of ground-mounted solar projects with capacities exceeding 5 MW-AC. While focused on key developments in 2017, this report explores trends in deployment and project design, installed project prices, operating costs, capacity factors, power purchase agreement (PPA) prices, and the levelized cost of energy (LCOE) among both utility-scale photovoltaic (PV) and concentrating solar-thermal power (CSP) projects. The utility-scale PV market continues to expand geographically across the United States, with 33 states home to one or more utility-scale solar projects at the end of 2017. For the first time in the history of the U.S. market, the lion’s share (70%) of new solar capacity added in 2017 is located outside of historical strongholds California and the Southwest, with the Southeast in particular accounting for 40% of all new capacity. Projects that track the sun throughout the day continued to dominate fixed-tilt projects, with nearly 80% of all new utility-scale PV capacity added in 2017 employing single-axis tracking. Median installed project prices declined to $2.0/WAC (or $1.6/WDC) in 2017, with the lowest 20th percentile priced at or below $1.8/WAC (or $1.3/WDC). Project-level capacity factors vary widely, from 14%-35% (on an AC basis), based on a number of factors, including insolation, tracking vs. fixed-tilt, and inverter loading ratio. On an average fleetwide basis, AC capacity factors have stabilized at around 27% in recent years as the increasing use of tracking compensates for the build-out of lower-insolation sites. PPA prices continued to decline, to below $40/MWh on average and with a few as low as $20/MWh (levelized, in 2017 dollars). These falling PPA prices have been offset to some degree by declining wholesale market value within a few higher-penetration markets like California, where an abundance of mid-day solar generation has suppressed wholesale power prices (see the text box on page 37 of the full report). Adding battery storage to shift a portion of this excess mid-day solar generation into evening hours is one way to partially restore the wholesale market value of solar. Recent PPAs for PV plus battery storage projects suggest that this technology combination has become significantly cheaper than it was just a year ago, and is increasingly attractive in higher-penetration areas (see text box on page 38 of the full report). The full Utility-Scale Solar report, along with an accompanying summary slide deck, a data file, and a number of interactive data visualizations, can be found at utilityscalesolar.lbl.gov. In addition, a free webinar summarizing key findings from the report will be held on Thursday, September 20 at 10 AM Pacific/1 PM Eastern. Register for the webinar here.